Syed Amir Haider Kamal, more popularly known as Kamal Amrohi was born in Amroha, U.P, India. He became renowned as a director who made 'Pakeezah', one of the most successful Indian films ever. 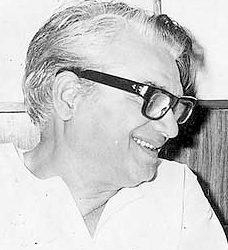 A writer and poet in Urdu and Hindi, Kamal went to Bombay in 1938 and joined the film industry. He worked as script writer for directors like Sohrab Modi, Abdul Rashid Kardar and K.Asif in his fabulous movie 'Mughal-E-Azam'. His movie 'Mahal' was produced by Bombay Talkies and later Amrohi established his own Kamal Pictures in 1953 and Kamalistan Studio in Bombay in 1958. His films scripted by himself are characterised by powerful roles and dialogues. 'Pakeezah' his third and most famous film has been planned for years and finally was started in 1964. Meena Kumari, his wife was the main character and the production of the movie was postponed indefinitely when the couple separated. After a gap of few years, they completed the film in 1971 which became a phenomenonal success bringing fame to Kamal Amrohi.